The MKBS was an N1-launched, nuclear-powered orbital battle station that would assure Soviet dominance of space through use of beam weapons. It was developed in 1969-1974, only to be ended when the N1 booster necessary to put it in orbit was cancelled. However the spacecraft and systems developed for it became the basis for the Soviet manned space program of the 1970's and 1980's. Soyuz 7K-S was a military version of Soyuz, originally developed as the ferry spacecraft for Mishin's Soyuz OB-VI military orbital station (themselves a replacement for Kozlov's cancelled Soyuz VI). The OB-VI was in turn cancelled in 1969 (after the end of the equivalent US MOL project). However development of the 7K-S continued, up to a series of unmanned test flights in 1974-1976. Thereafter it was abandoned, and after protracted development emerged as the Soyuz T transport to Soviet space stations in the later 1970's. The MKBS grew out of Korolev studies in the 60's (OS, TKS Heavy Space Station, OP) for N1-launched earth orbit stations. Although details of the MKBS and its MOK core module were disclosed previously, there was no indication of the level of effort being devoted to it. Although with the cancellation of the N1 the MOK station core was abandoned, other elements of the program continued. MKBS-1 was in fact the original designation for the Mir station and its support spacecraft. So the Progress resupply ships, Soyuz T transport, the Aelita free-flyer telescope, and the modules of Mir all began as MKBS docked or free-flying modules. Mishin's diaries reveal that the 7K-S was being developed as the shuttle-to-orbit portion of the N1-launched MKBS military orbital space base. This work continued full bore heading toward a launch of MKBS-1 in 1977 until the N1 was cancelled in 1974. The diaries also reveal (as hinted at by Chertok) that an ultimate objective of the MKBS was to operate and service a series of beam weapons in earth orbit. This was alleged in leaks to Aviation Week in the 1970's during the Carter administration (and contributed to the pressure for Reagan's Star Wars program). But detailed contemporary evidence has not been available before. 5. Block "D" - (full responsibility) - including experimental work. On 4 October 1967 Mishin conducts a rather grim review of the cutbacks to his OKB's budget for 1968. Consider the shortfall in his request compared with the challenge of beating the Americans to the moon! The true purpose of MKBS is first revealed in a notation on 24 January 1969: (2-159) "MKBS - Under the guise of national economic objectives will be used to create a system of special space weapons." On 10 January 1969 (2-184), Meeting with SA Afanasyev: YuA Mozzhorin: N1 is the basis for MKBS. Try "Almaz" on the N1 (as a quick solution?). MS Ryazanskiy: Our biggest problem - we think only 2 - 3 years ahead. Are we no longer prepared to create a TOS Heavy orbital station? After 7K-VI need to create a large space stations. Chertok: It is good that the program proposed by the Soviet of Chief Designers was approved unanimously. Big manned spacecraft to Mars (and from that to derive standard modules with automatic options for Earth manned flights.) MKBS - for defense purposes. VK Bezverby: Use EYaRD nuclear electric propulsion for deep space missions and MKBS (for defense purposes). On 9 February 1969 MV Keldysh is warning that these projects should use the existing N1 and trying to justify a program to upgrade it are premature (2-197). "MV Keldysh - MKBS (use the existing launch vehicles) and direct broadcast satellites could also use existing LV's. Proposals for modernization are premature. Mozzhorin, Narimanov - also against the modernized N1M." By 10 February 1969 Mishin is considering MKBS weapons aspects and the use of the transport version of the 7K-VI with the station: (2-194): "12. Strictly analyze planning for design and development of space weapons systems (separation minima). In achieving mastery of outer space payloads over 100 t are needed, as MKBS should have an orbit above 10,000 km. (Necessary to study optimum orbit). Consider the design of the docking system of the 7K-VI, which provides a transition from one ship to another." "Luch" (evidently a reference to an N1-launched geosynchronous satellite, or a beam weapon, not the later Luch communications satellite) - you need to develop (especially realistic antijamming measures). NA Pilyugin - against the N1M LV. 5. Organize mass production 7K-S at the plant in Omsk (or in the factory "Progress"). (Omsk is chosen - Mishin will regret this later). 6. Hydrogen blocks N1 Block Sr and N1 Block S - TsKBEM factory and plant "Progress." 7. Instruct Affiliate TsKBM (comrade Bugayskiy) development of MKA (shuttle) according to TsKBEM's requirements (an interesting allusion to the very start of development of the LKS space shuttle by Chelomei's organization). 5 March 1970 (2-263): "VK Bezverby - It is necessary to make a proposal for the establishment of heavy MKBS." Notes on 24 September 1970 (2-287) provide an idea of the schedules - Modernization of the N-1 (5 yrs). 1971 - Draft project - N1-L3M (N1S). 1972 - Draft project - MKBS. 1974 - Beginning of MKBS. On 25 September 1970 comes the definite news that the MEK Mars expedition (2-287) is off, but the MKBS ('the big girdle') is still under consideration by the military industrial commission. The N1-launched Luch communications satellite is to come in 1973. AM Isaev - about speeding work on the engine 11D56 (RD-56). AM Lyulka - about speeding work on the engine 11D57 (RD-57). 1. S, Sr - LOS (the OS-1 Lunar orbital station?) SNTV satellite for direct TV broadcasting, MAVT (MAVR? ), DOS-II (later Mir). 3. S + S + Sr - L3M, MKBS, Mavr and others. 4. NII - DOS (20t - indecipherable) - this apparently refers to later plans to dump Chelomei's Proton vehicle and go back to the original plan to use the N11 (consisting of the second and third stages of the N1) for this earth orbit payload class. 5. N1S => 110 t (the low earth payload for this version of the improved N1 - this is a previously unidentified designation, perhaps referring to the N1 using the Block S Lox/LH2 upper stage). More MKBS military applications (possibly as a communications station with submerged submarines) are mentioned on 30 October 1970 (2-294): "Chembrovsky - On the application of long waves (1 km) to the MKBS." And again on 12 November 1970: (2-299): "12:00 - DF Ustinov (Smirnov, Keldysh Afanasiev, Serbin, Stroganov, Kommissarov, Tsarev, Kerimov and others.) ... 2) MKBS - Accelerate after 1973. It is necessary to accelerate the draft resolution on the MKBS and associated activities - EYaRD, reusable transport spacecraft." Meetings in January 1971 continue the level of coordination (4, 10, 12 January (2-314)). A note on 16 January (2-320)indicates that a primary purpose of the DOS Salyut station was to demonstrate long-stay crew endurance for the rotating crews of the MKBS: "10:00 - IMBP (Vorobyev, Gazenko, Nefedov) About 30-day flight to the DOS number 1. Increasing the duration spaceflight on these DOS missions. Work on the MKBS." On 23 March Mishin is already dealing in delays with getting the MIK facilities in Baikonur converted to MKBS work: "There is no clarity on hydrogen handling and lightning protection systems; Need supply of equipment; There's nothing on the long-term work (test stands, MIK expansion, MKBS accommodation, and EYaRD)." By May the planning has progressed to the point where there will be an MKBS-1 with a DOS core (AKA DOS-A, later Mir); while MKBS-2 will use the MOK N1-launched core: 7 May 1971: "At the Soviet of the State Chief Designers (17K)- About DOS number 3 and number 4 and DOS-A (MKBS-1)." Bezerby VK and Melnikov MV - Materials on the experimental base for EYaRD. Okhapkin SO - About the acceleration of work on blocks N1 Block R and Sr. Call Karpov AG - On specifications for MKBS-1. The development of the MOK should be in full swing, but testing of individual systems should be conducted on the MKBS-1 (DOS). The main question - how long can a man live in space, and what can he do better than automatic systems? And on 18 May: "Bushuyev KD and Bezverbo VK: Justify the need for the MKBS-1 based in DOS." In June 1971 another disaster - the Soyuz 11 crew dies after visiting the first DOS station (Salyut 1) when their capsule depressurizes during return to earth. Following the N1-L3 program failures, this leads to loss of support for Mishin's always-ambitious future plans (as contrasted with his dismal performance getting reliable hardware to fly). 8. Identify what you need to alter based on testing. 9. Proceed with development of hydrogen stages, but you need to use the existing stages for now. In a follow-up call to Afanasiev on 2 August, Mishin notes: "On conclusion of the expert committee on the N1-L3 (and Comrade Tsarev VPK): 7KS - MKBS-1 - MKBS-2 - Continue; Enlarge the crew to six people for short stays." On 10 August the MKBS is seen in the context of its military application and a unified program with DOS and Almaz: "Meeting of the Central Committee Comrade DF Ustinov (The main directions of development of space weapons for 1971-80 biennium). ... DOS - Almaz - MKBS-I - MKBS-II: Philosophy: Continuity." This leads to staff meetings in the following days to emphasize a modular approach to MKBS (12 August - "Meeting with Bezverby VK on MKBS (philosophy of design). Yurasova IE - philosophy of building block control systems for MKBS. MKBS = Integrated module consisting of blocks. Modules = integrated function blocks. Function blocks: General Purpose, Specialized, Service. General purpose units: (control systems, power, habitation, etc.)." The issues of the crew shuttle to be used (evidently choices are the existing Soyuz, 7KS, Chelomei's spaceplane, or the new high L/D spacecraft): "Bezverby VK MKBS-1 on N-1 and variants of crew transport spacecraft (2-362 21 September): and on 26 September: "About MKBS-1 product number 10, 11 - N-1. (Which LV will deliver crew - 7K-T) - Consider options." By 29 September, details are being analyzed (2-346): "Chertok, Bezverby - Discussed the docking systems for heavy modules (MKBS)." The draft decree for the station, however, is stuck in reviews by the leadership: "Called Afanasiev- Status of the draft decree on MKBS (lies with Rabinovich). The draft decree on development of greater power (the letter is with EP Slavsky)." 2. Improving upper stages N1 Block G, N1 Block D (performance, reliability and survivability, operational testing). 3. Development of DM (later Proton 11S86) with operational testing. 5. Development of block N (evidently a reference to a nuclear N1 upper stage - which would eventually be the Interorbital Tug. 5. SA (reentry vehicle) reusable. Detailed work on test stands for block Sr and MKBS is begun on 15 November. As the program goes into 1972, hardware is being developed; but Mishin is losing support for the existing program. On 16 June 1972, Mishin notes problems with 7KS at Omsk and the rationale for continued testing of Kontakt: "1. Klyucharev VM: Omsk plant (Director Kolupaev) - Delayed production of 7KS living compartments. ZEM - develop work and schedules to recover schedule for completion of 7KS modules. 2. Chertok: 7K-OK number 18 - rework using the proulsion system from number 36. Work on "Kontakt" to continue, as it can be used in the MKBS'. The new operational test philosophy and weaponry for MKBS is elaborated in a note on 30 June 1972: (3-65): "Review the possibility of testing and testing of avionics for the spacecraft on the MKBS in real space conditions instead of working in ground conditions with stands and costly ground installations that simulate space flight conditions. Review MV Melnikov's materials on the use of electronic and neutron beams for special purposes." 6. Accelerate work on MOK - MKBS 1st step. 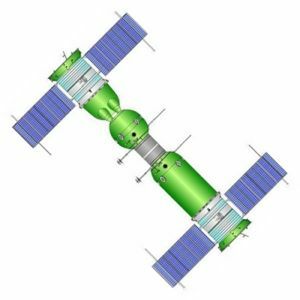 New propulsion approaches are considered on 20 September 1972: "Controllabe microelectric engines for spacecraft, DOS and MKBS (Ovchinnikov VS)." On 23 November 1972 N1 7L explodes just short of first stage burnout. The entire program is in jeopardy, but the Five Year Plan must be fulfilled. On 9 January 1973 Mishin marshals his arguments to continue: "On the advice of the Soviet of Chief Designers once again emphasize the importance of N-1 (primarily for the Lunar Expedition and directions indecipherable). As long as getting to the moon cannot be accomplished, emphasize the MOK (MKBS) and DOS." Technical Positions for MOK development. 1. MOK - the minimum number of the most standardized rocket and space systems, to solve all problems in the foreseeable future in near-Earth space in the interests of science, the economy and defense. 2.) Space-based MOK systems - the most cost-effective solution to the problem of getting a significant increase in the service life of the missile and space vehicles. 3. The modular structure of MOK's standardized elements, components, systems and assemblies. - Propulsion systems (DO, DPO, SKD, main engines). - Control and orientation systems. - Navigation systems (automatic and manned spacecraft). The elements of these systems must be maintainable and interchangeable. 4. All satellites modules should be automatically controlled spacecraft providing for the possibility of repair of all their vital elements with special manned spacecraft for on-orbit service, or repair modules from the MKBS delivered orbit-to-orbit by MKBS special spacecraft. 5.) There should be a phased approach to create MOK with maximum use in the initial phase of existing rocket and space vehicles. 9.00 - Departure for meeting at number 33 (with GK Kerimov, Tishkin). 1. The first 2-3 volumes of MOK and other materials. 2. Abstracts of the NTS on MOK. 3. Specifications for the MKBS-1. 6. The composition of the payloads number 8 to number 13, inclusive. Review materials sent from Moscow. 1. Long-term program TSKBEM (projected) (See. Ref. 4/4748 dated 10 October 1973 from MOM). Performance in accordance with the "additional materials to the plan for experimental work in 1976-1990. See ref. 10414 dated 6.XII.1973. 2. TSKBEM work plan for 1974. - No specification from TsNIIMMASH for the heavy launch vehicle (not to mention its scientific and technical justification). 3. Thematic plan for experimental work for TsKBEM in 1974. All these materials require serious revision. (Focused, real and concrete, etc.) -Need to reduce the subject areas, the scope of work and remove excessive detail. Call Bezverby VK - For papers on MOK. What will NII-4 (the leading military space research institute) handle? Support in the MO (Ministry of Defense) for the N-1 - signed by Alekseyev Nikolai and Tolubko. - The draft memo on the need of long-term integrated planning by the state. TsKBEM work on MOK - 1st to attempt its development. 21. Form a unit in TsKBEM for special equipment (e.g. classified military) (for some complexes). 22. Develop ideas on the feasibility of developing and creating two-stage rocket for launch into low earth orbit. (Comparison with 3-stage rocket, the advantages and disadvantages). 23. Conduct a study on the feasibility of establishing MKTS based on two-stage rocket. 24. 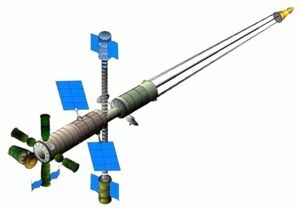 Conduct research on performance 2-stage rocket for launch of payloads to earth orbit using different fuel components (Including solid propellant). 25. Elaborate design for a surveillance module based on MKBS-1 derived from the N-110. 26. Review a 2-stage N-1 for MKBS-II, a 3-stage for moving heavy SM modules to geostationary orbit and lunar orbits. 1. His attitude to R-7M. Who is going to build it? 2. His attitude towards the N-11. (2-stage for moving spacecraft to sun-synchronous orbit). 3. On the sequence of launches of DOS and "Almaz". 4. On the development work on MOK. About MOK - based on our promising developments. Basis MOK - space-based, and it should be checked already on the DOS-5 having two connecting nodes. 5. On the shuttle on the basis of R-7M. 1) MTKK Space Shuttle - manned version for delivery and return of the crew of astronauts on the MKBS (perhaps the origin for the later Zarya spacecraft). 2) MTKK Space Shuttle - cargo version. 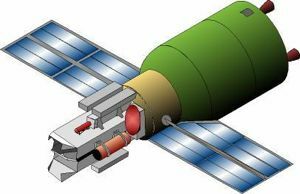 3) SM Special Module - a non-returnable, autonomous and dockable with the MKBS (all-weather reconnaissance) (perhaps the origin of the later USB spacecraft). 4) MSK - the inter-satellite ship - automatic and manned. Launch vehicle - N-11 Payload = 18 tons (23 tons) (perhaps the origin of the later 37ks spacecraft). Mishin was removed on 2 May 1974. The N1, and the spacecraft it was to launch were cancelled. MKBS-1 continued as the Mir project. Military research was moved to Chelomei's Almaz and TKS spacecraft. But Mishin's convey the ambition and scope of the MKBS project, and make clear that the path of Soviet manned astronautics for the remainder of the century was established in that program.